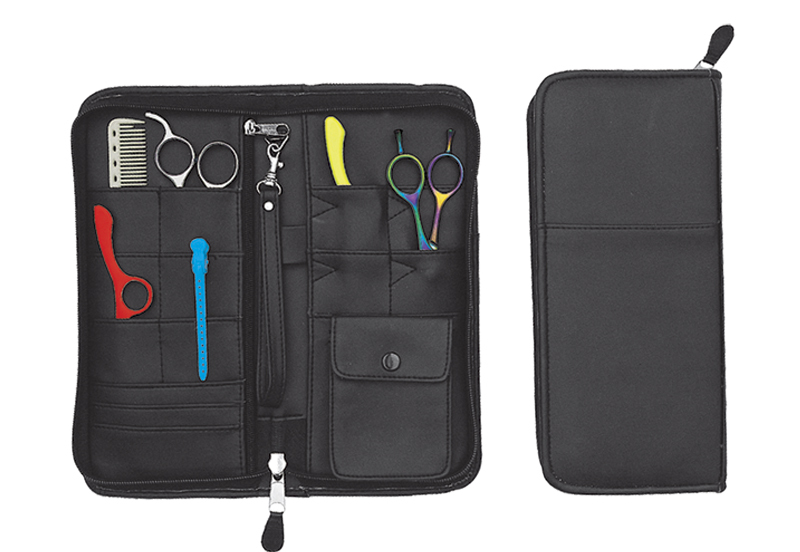 Hairdressing tools are valuable so protect them with a professional hair scissor case. As a professional hair stylists, you are bound to have a large collection of hairdressing scissors and hair products. Our top of the line hair scissor cases will keep you organized and ready to meet the demands of your clients. With storage space for your cutting shears, thinning shears, and hair cutting combs you will always be able to find what you are looking for in these scissor cases. Some of the larger cases also have room for hair clips and hair brushes! Made from high quality materials, these scissor cases are designed to hold up to the demands of your day as a hair stylist. The scissor case craftsmanship is also stylish, allowing you to maintain your sense of fashion. These hair scissor cases are trusted by professionals the world over and you will love them. Genuine leather, 6 shear pockets, Protective flap and Snap closure. Genuine leather Scissor case with 14 pockets for shears or other tools. It has a protective flap and a snap closure. Large Leather Zipper Scissor Organizer Case that has 10 pockets plus holds all Basic Salon Tools & Shears, Lots of Pockets to Hold Cash, Cards, etc.